Small breakout board for the PIC Microchip ENC28J60. Contains all the necessary hardware to implement an Ethernet interface including the isolation transformer and LINK/STATUS LEDs. SPI interface makes this one of the easiest 10Base-T ICs yet! 3.3V with 8KB buffer. Space between rows : 0.8"
Coupled with the correct microprocessor and this is awesome. Gotten UDP and DHCP working so far with a PSoC3. Check it out at: flickr. Thank you! What is L1 uH ? could you please add the value for L1 in the schematics? Hi there, Could be possible to use this part without Assembler or C programing in a PICAXE part ? Someone have used it on Arduino Due? Seems that every library available for that board aren't compatible with Arduino Due. Does this works with arduino..?Can i get the library for this..? It works over an SPI connection, so you could use this with an Arduino. Unfortunately, I'm not currently aware of any libraries for this particular part, but you may want to try checking on the forums. 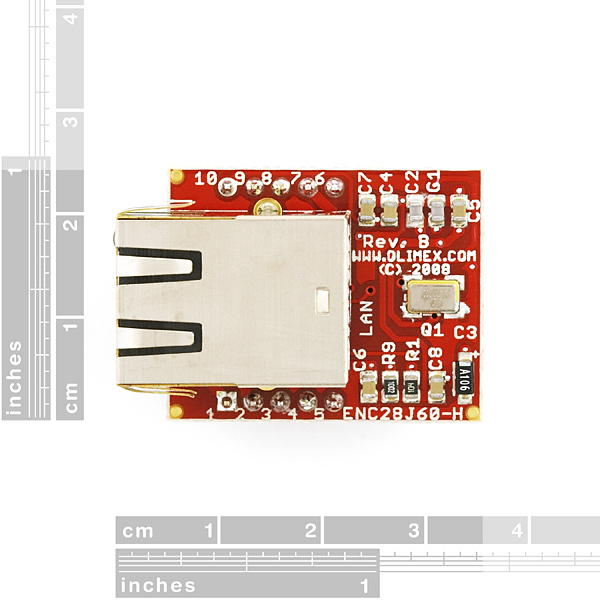 There may be a different library available that could be adapted for the Arduino environment. This will probably work with the Ethercard Library. Hi everybody! Would anyone answer me if this device can do http requests (http get and http post)? I need to communicate a project with internet to send and receive string data by http requests. I should clarify my last post and say that you COULD do the same thing with this chip, but you'd have to implement the TCP/IP protocol on top of doing all the rest--the W5100 at least has that part done already. As has been mentioned before though, there are libraries available for this chip that do that (though it depends on the uC architecture you're using) but again, that's at least one more thing you have to handle in code. I find the W5100 to be very handy for Ethernet-to-microcontroller interfacing. In fairness, it's a much newer (and more heavily integrated chip) than the ENC28J60. The primary advantage that the ENC28J60 gives you is direct access to the bits, at a lower level. Therefore, for some applications it's superior. Oh, also the ENC is available in a DIP package. You would need something at a higher level than this, this chip operates at layer 2 on the OSI model, you're looking for something at layer 7 (HTTP). You need an embedded web server, or you can put a simple one together with a microcontroller, Wiznet W5100 and an HTTP server application. I've done this with an Atmel Mega88, but it was BARE BONES and VERY application specific. It took every bit of spare flash to store the strings necessary to generate the HTTP responses. Also, you'll need to learn a lot about the HTTP protocol to write your own server. 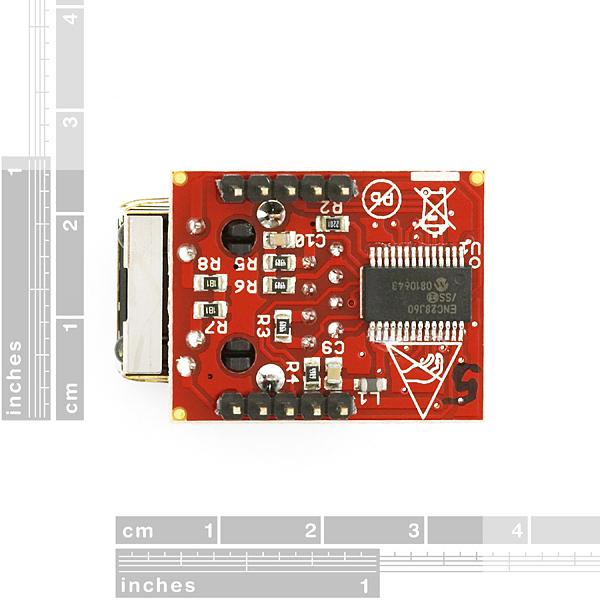 I'm not an Arduino guy so I don't know for sure but I think there are Arduino libraries available for driving the W5100 and providing HTTP server functionality (probably with an SD card). In any case, if you don't want to shell out the bucks for an embedded server, you'll have to combine several components (and do some programming) to build one. Would you have to level-shift this to use it with a typical arduino? For those of you who might be wondering - After checking the datasheet, I found that the ENC28J60 has 5V tolerant inputs, despite the fact that it is a 3.3V chip. 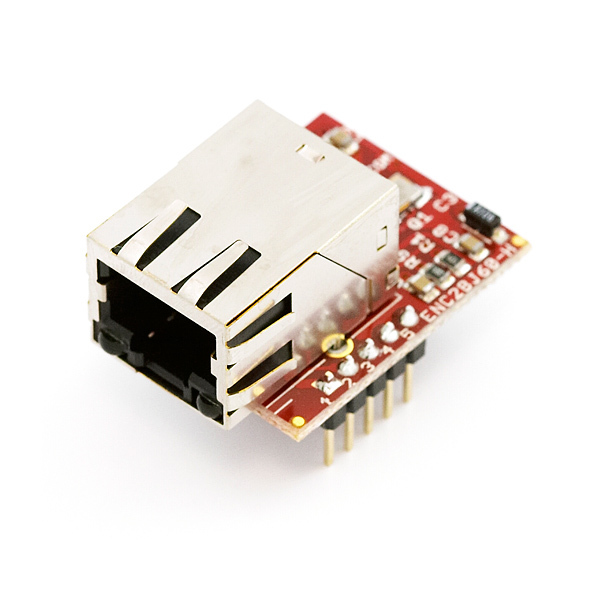 Would the standard Ethernet library for Arduino be compatible with this board? Would it use the same pins as the Ethernet Shield? This is perfect for use with arduino. There are a few good libs. You can find shields based on the enc28j60s on ebay for cheeper than this. But breadboard compatible is pretty worth it. you can use their librarie! I believe that the ethernet shield is based on the Wiznet W5100. Which is completely different. This board requires a TCP/IP stack like UIP. Using a atmega644 I was able to implement several simultaneous sockets including a HTTP server, serving 'dynamic' pages. Pretty slick but power hungry. Eagle? Will Olimex give the eagle files out? Guess I should go poke around on their website, then. Does anyone know the inductor value L1 on this device? And when is the ENC28J600 version (100mbit) coming out? It's not an inductor, it is a ferrite bead. Huh, they haven't specified in the schematic. Nothing 802.3af compliant...needs different magnetics. Is it possible to implement PoE (Power over Ethernet) with this? Nope doesn't break out the pins needed for that.